Designed with equal parts style, innovation, and versatility, the MET-Rx BlenderBottle SportMixer rises to the challenge of your active and busy lifestyle, redefining what it means to be a “water bottle.” Say goodbye to lumpy protein shakes and hello to smooth, great-tasting drinks. The patented mixing system uses the BlenderBall wire whisk—found only in BlenderBottle brand shaker cups—to mix even the thickest ingredients as you shake. The SportLoop is surprisingly handy – you’ll wonder how you ever went without it. Made from only the highest-quality materials, BlenderBottle brand shaker cups are—and always have been—BPA and Phthalate free. Made of durable Eastman Tritan plastic, the SportMixer lets you enjoy today's smoothie without tasting last week's protein shake. Workouts and workdays can get mundane, but that doesn't mean your nutrition shakes have to. Add ingredients like peanut butter, applesauce, or yogurt to your protein or meal-replacement shakes for added flavour – the BlenderBall whips them in with ease. 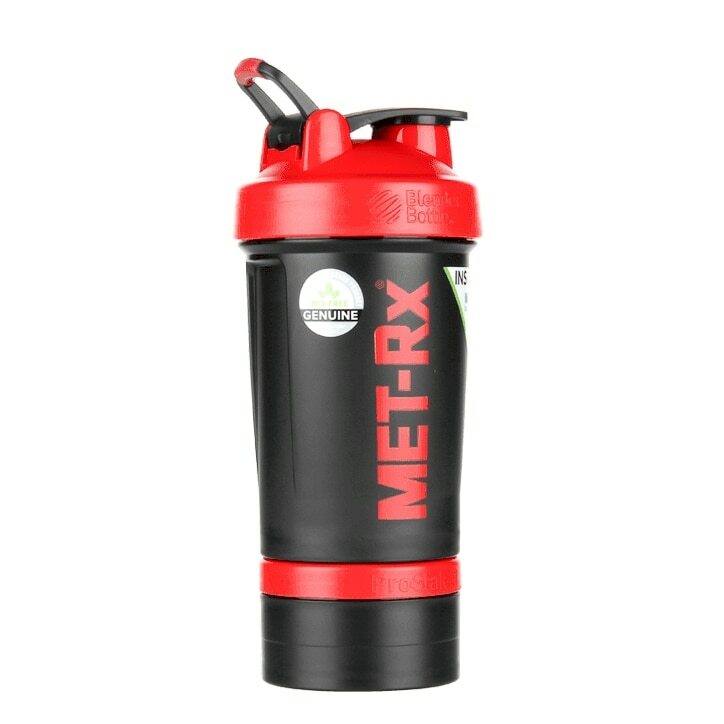 Met-Rx Pro-Stak Shaker Cup is rated 5.0 out of 5 by 1.